"It is very likely that within fifty years when all the trivial, verbal disputes about the meaning of Teilhard's "unfortunate" vocabulary will have died away or have taken a secondary place, Teilhard will appear like John of the Cross and St. Teresa of Avila, as the spiritual genius of the twentieth century." Fulton J Sheen - Footsteps in a Darkened Forest, (New York: Meredith, 1967) page 73. "It is doubtful if any Christian of this century can be fully aware of his religion until he has seen it in the cosmic light which Teilhard has cast upon it." Flannery O'Connor - The Presence of Grace. Fr. Pierre Teilhard de Chardin S. J. (Tay-ahr de Shar-dan), a great man of science and faith, was the inspiration that caused many to delve deeper into the mysteries of God's creation and our place in it. Teilhard was little known, yet his influence on Christianity has been significant. "One of the 20th Century's most remarkable prophetic thinkers, an Aquinas of the atomic era". (Time Magazine - Oct. 16, 1964). The 20th Century saw an astonishing advance in scientific knowledge, incomprehensible to all but the most learned scientific minds. The very nature of space, time and our material world has been shown to exist in states that defied past understandings. Increased consciousness of our place in nature led to the discovery that creation of the cosmos was not static but progressing through time to some future state. Our existence as reflective beings in this strange new world required deeper insights into the relationship between spirit and matter. For Christianity, the intellectual tragedy of the twentieth century has been the failure to understand evolution as a source of theological solutions rather than problems. The Catholic Church was blessed to have people like Teilhard de Chardin who recognized that these new scientific discoveries were not hostile to the mission of the Church. He saw clearly that evolution had positive theological implications. But Rome silenced him. As in past ages, those at the forefront of knowledge are often charged with heresy and Teilhard did not escape this label. Teilhard, a loyal and humble son of the Catholic Church, suffered much because of restrictions placed on him by leaders of his faith and his Jesuit order. His ordeal was the frustration of enforced silence and heroic submission to authority. After his death, those who recognized the magnitude of Teilhard's seminal understanding of the connection between science, evolution and Christianity published The Phenomenon of Man, The Divine Milieu, and other of his writings. The three last volumes in Teilhard's collected works are a good introduction to the man and his unique vision. These are titled, The Heart of Matter, Christianity and Evolution and Toward the Future. The difficulty that many people had in understanding Teilhard was the specialized language he used to construct a coherent whole embodying both science and faith. He used scientific language to describe reality and religious language to explain how this reality was communicated. Teilhard was far more than an outstanding priest, philosopher and scientist. He was a rare human being who formed deep friendships and whose quick wit and warm personality affected all who knew him. In 1959, Pope John XXIII announced the second Vatican Council which opened in 1962. Also in 1962 the Holy Office issued a monitum (warning) regarding the writings of Father Pierre Teilhard de Chardin. Nevertheless Teilhard's insights were influential in formulating Council documents. It was Joseph Ratzinger who is said to have penned Cardinal Fring's' famous line about the Holy Office, asserting that its "methods and behavior do not conform to the modern era and are a source of scandal to the world." See "Montium" at sidebar. Pope Benedict XVI Homily at Vespers in Aosta, July 31, 2009 - "The role of the priesthood is to consecrate the world so that it may become a living host, a liturgy: so that the liturgy may not be something alongside the reality of the world, but that the world itself shall become a living host, a liturgy. This is also the great vision of Teilhard de Chardin: in the end we shall achieve a true cosmic liturgy, where the cosmos becomes a living host." Avery Cardinal Dulles, (1983) - The Catholicity of the Church, page 117" - "In the words of Teilhard de Chardin: 'When Christ says through his priest, This is my Body, these words overflow the piece of bread upon which they are pronounced; they bring to birth the entire Mystical Body. Beyond the transubstantiated host, the priestly action extends to the cosmos itself, Teilhard did not mean that the universe would literally turned into Christ's eucharistic body, as some have imagined. ... Teilhard gave poetic expression to this thought in his inspiring meditation, 'The Mass Over the World'". "... against the background of the modern evolutionary world view, Teilhard depicted the cosmos as a process of ascent, a series of unions. ... From here Teilhard went on to give new meaning to Christian worship: the transubstantiated Host is the anticipation of the transformation and divinization of matter in the christological "fullness". In his view, the Eucharist provided the movement of the cosmos with its direction; it anticipates its goal and at the same time urges it on". "The international scientific community and, more broadly, the whole intellectual world, are preparing to celebrate the centenary of the birth of Father Pierre Teilhard de Chardin." "I am happy, Your Excellency, to communicate this message to you on behalf of the Holy Father, (Pope John Paul II) for all the participants in the conference over which you preside at the Catholic Institute of Paris as a tribute to Father Teilhard de Chardin, and I assure you of my faithful devotion." "The impetus given by Teilhard de Chardin exerted a wide influence [on the Council]. With daring vision it incorporated the historical movements of Christianity into the great cosmic process of evolution from Alpha to Omega. … The Council’s ‘Pastoral Constitution on the Church in the Modern World’ took the cue; Teilhard’s slogan “Christianity means more progress, more technology,” became a stimulus in which the Council Fathers from rich and poor countries alike found a concrete hope" . "The Eucharist is also celebrated in order to offer 'on the altar of the whole earth the world's work and suffering' in the beautiful words of Teilhard de Chardin." The pope was referring to prayers in Teilhard's Mass on the World, which the latter had said 80 years earlier in the Gobi Desert, when he had run out of bread and wine and made the whole earth his altar. Avery Cardinal Dulles, S.J. - A Eucharistic Church: The Vision of John Paul II - McGinley Lecture, University, November 10, 2004. "In his own poetic style, the French Jesuit Teilhard de Chardin liked to meditate on the Eucharist as the firstfruits of the new creation. In an essay called The Monstrance he describes how, kneeling in prayer, he had a sensation that the Host was beginning to grow until at last, through its mysterious expansion, 'the whole world had become incandescent, had itself become like a single giant Host.' Although it would probably be incorrect to imagine that the universe will eventually be transubstantiated, Teilhard correctly identified the connection between the Eucharist and the final glorification of the cosmos." Page 38 - 'The pan-Christic' universalism of Maurice Blondel and Teilhard de Chardin has, in some respects, become official Catholic teaching in Vatican II's Pastoral Constitution on the Church in the Modern World. page 43 - The Teilhardian formula, 'union differentiates', casts additional light on the concept of catholicity. ... 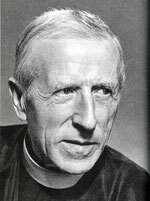 The Church may be called in the terminology of Teilhard de Chardin, the 'consciously Christified portion of the world". Hardly anyone else has tried to bring together the knowl­edge of Christ and the idea of evolution as the scientist (paleontologist) and theologian Fr. Pierre Teilhard de Chardin, S.J., has done. ... His fascinating vision has remained controversial, and yet for many it has represented a great hope, the hope that faith in Christ and a scientific approach to the world can be brought together. ... These brief references to Teilhard cannot do justice to his efforts. The fascination which Teilhard de Chardin exer­cised for an entire generation stemmed from his radical man­ner of looking at science and Christian faith together.